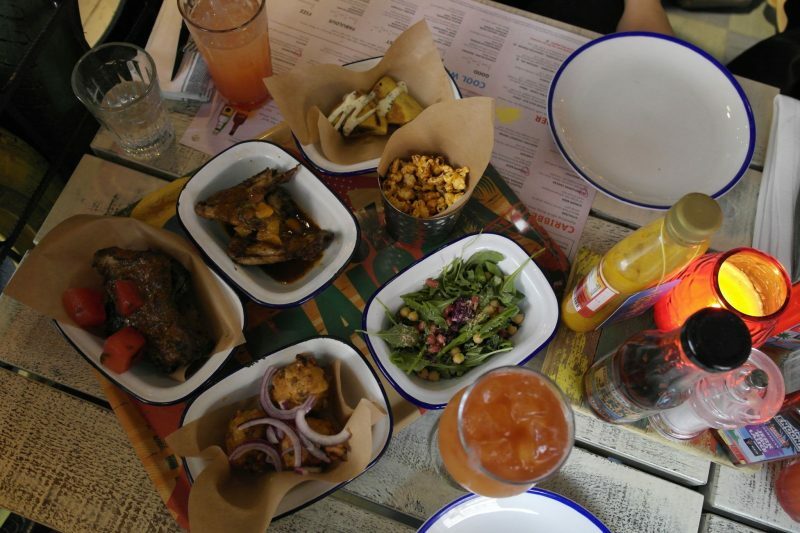 There are some restaurants I really look forward to returning to… the prospect of another visit to Turtle Bay to sample some more Caribbean inspired dishes had my mouth watering a bit! 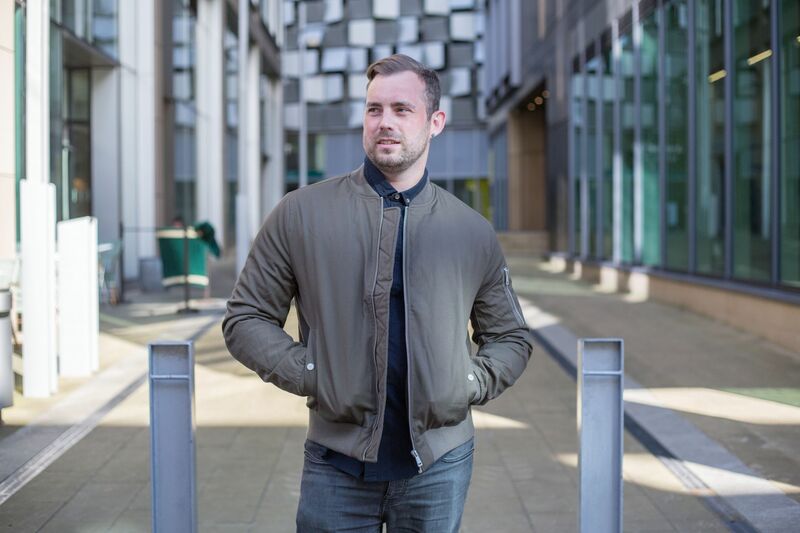 I was recently invited along to check out their new summer menu, so last Friday I went along with a couple of friends to find out more! 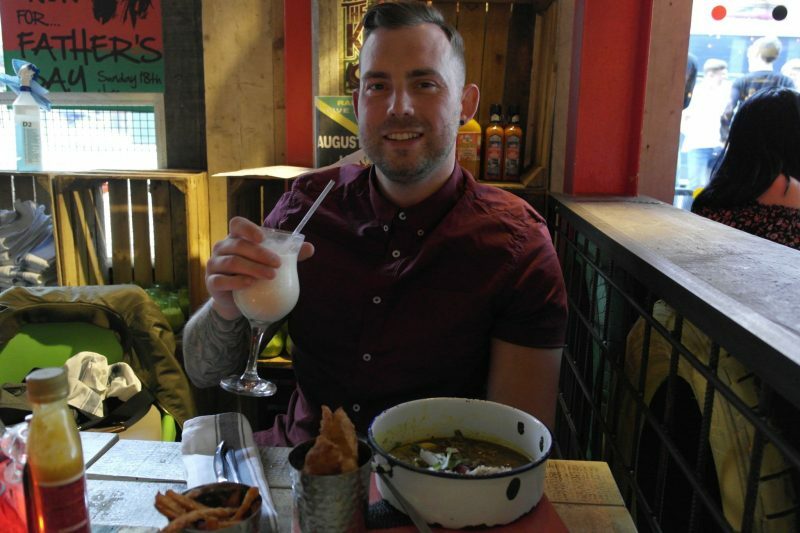 This being my second visit to Turtle Bay, so the bar had already been well and truly set if you caught my last review where I described it as a restaurant I’d definitely recommend visiting! For starter we opted for the just jerk platter that was packed with lots of snacks including marinated jerk chicken wings, glazed pork ribs, jerk beef riblets, Jamican beef patty, sweet corn fritters, spiced popcorn and herb mayo super green salad.We also chose the okra ladies fingers, which were spiced panko coated okra fingers with mango mole fresh lime and coriander mayo. For me, the glazed pork ribs and jerk glazed chicken wings stood out as the tastiest items on the platter. The meat on the ribs was really tender and nearly fell off the bone. And those wings… is there a better glaze for chicken? 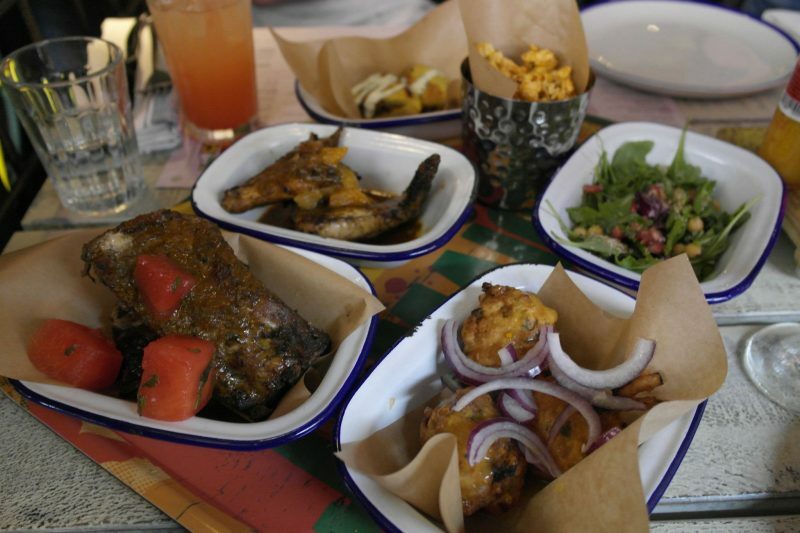 If you like a bit of a kick you’ll love the jerk chicken! I really wasn’t sure about the ladies fingers, it has it’s own unique flavour hard to describe! You’d just have to try it for yourself… I was just pleased the sharing platter had lots of other items I liked! Next up the main courses, Mo bay chicken marinated chicken breast, cooked in a spiced creamy jerk sauce. 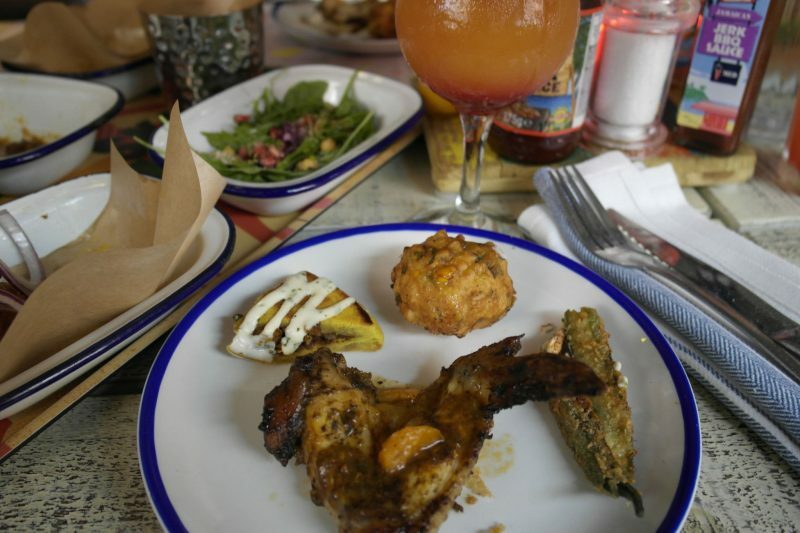 Served with coconut rice ‘n’ peas, sweet plantain & super green salad. I was really tempted to try this myself as it had a slight resemblance to Thai curry… there’s always next time! Spinach, aubergine & sweet potato curry Spinach, aubergine & sweet potato in a fragrant light curry sauce. Green beans, kidney beans & sugar snap peas cooked with Jamaican spice. Served with steamed rice & roti flatbread. 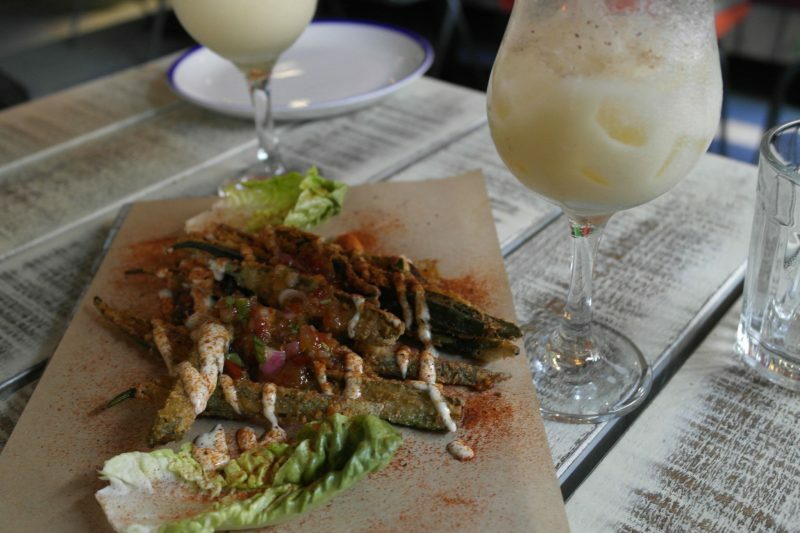 The presentation of the dish was a bit unusual in the glass dish, but this is Turtle Bay and I like things like this as it gives it a real quirky edge. I couldn’t resist trying the curried goat, marinated goat meat slowly braised and cooked in in our house blend of curry spices, scotch bonnet, citrus juice & fresh ginger. 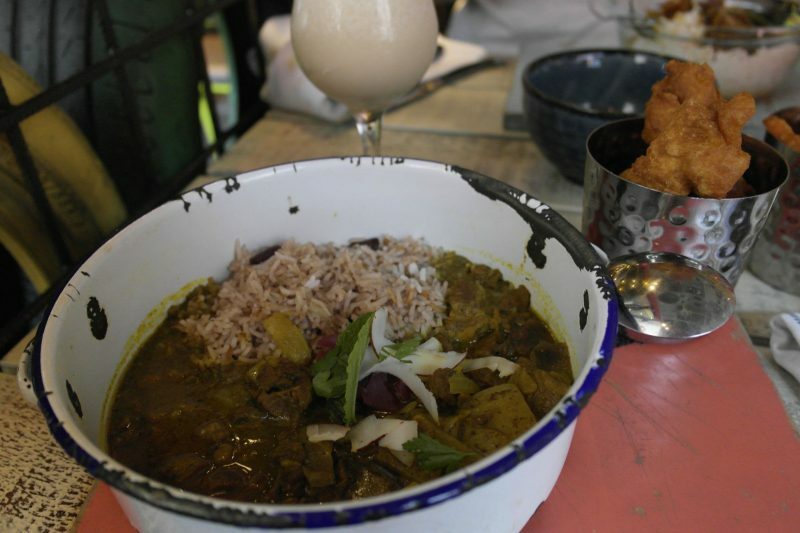 Served with onion chutney, fresh green seasoning, coconut rice ‘n’ peas & festival dumplings. I was pleased with my choice, the goat meat was really tasty and beautifully tender! 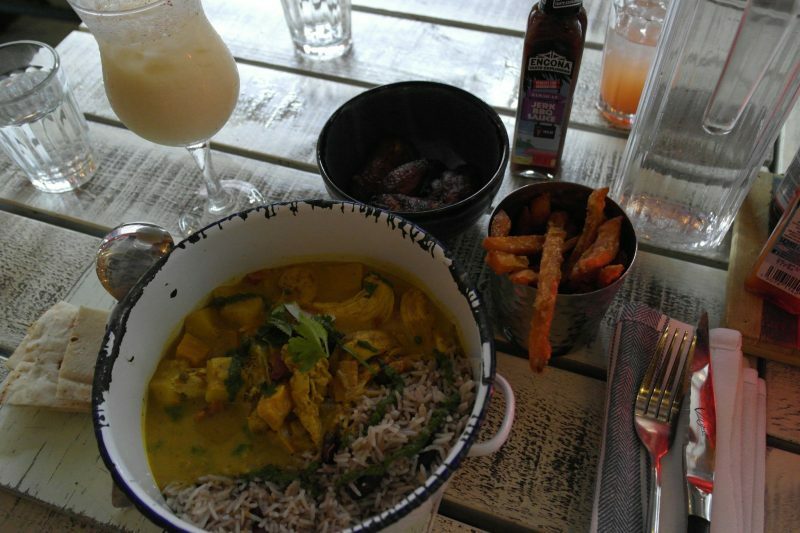 The curry sauce had a slight kick to it, similar to the jerk jerk sauce. For me the dumplings didn’t seem to go with the curry, but they were quite delicious. 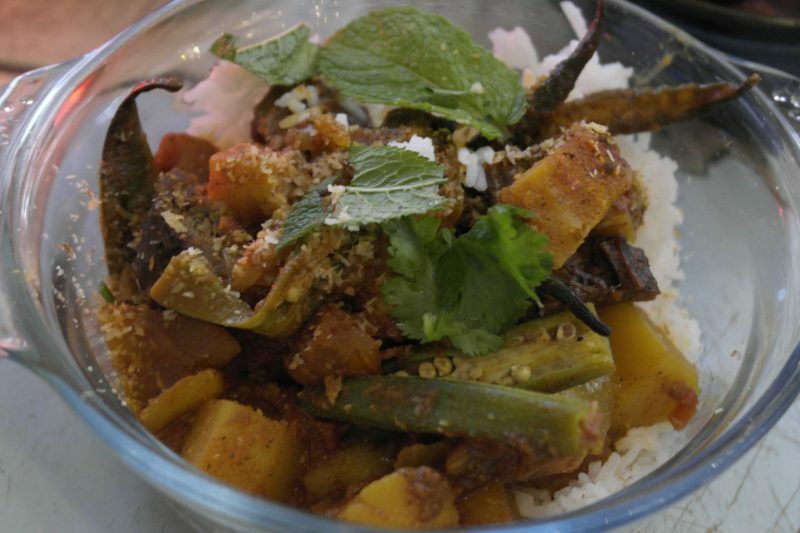 Definitely a dish to try if you like your food a little bit spicy! No trip to Turtle Bay is complete without trying one of their desserts. 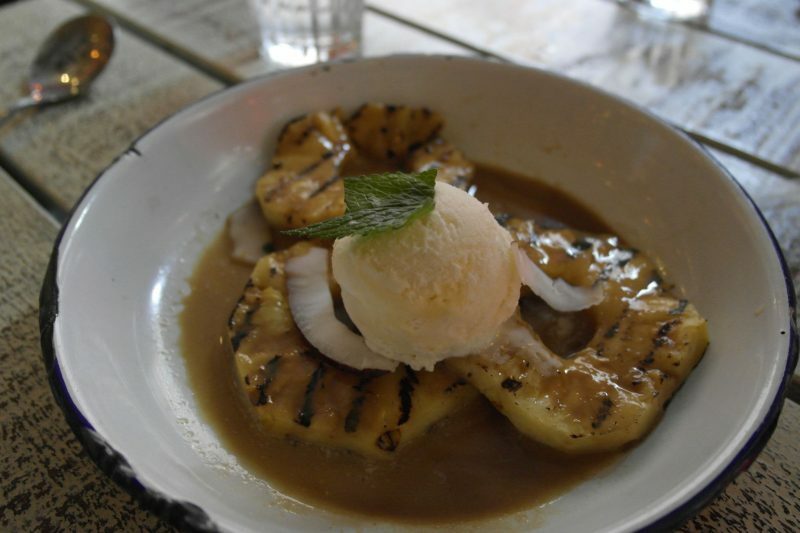 Adam chose the fresh BBQ pineapple caramelised & grilled fresh pineapple, rum caramel sauce, coconut ice-cream. For Chris and myself, it was a very easy choice… the banana & toffee cheesecake triple layered cheesecake with crispy biscuit base, creamy soft cheese, banana & toffee. 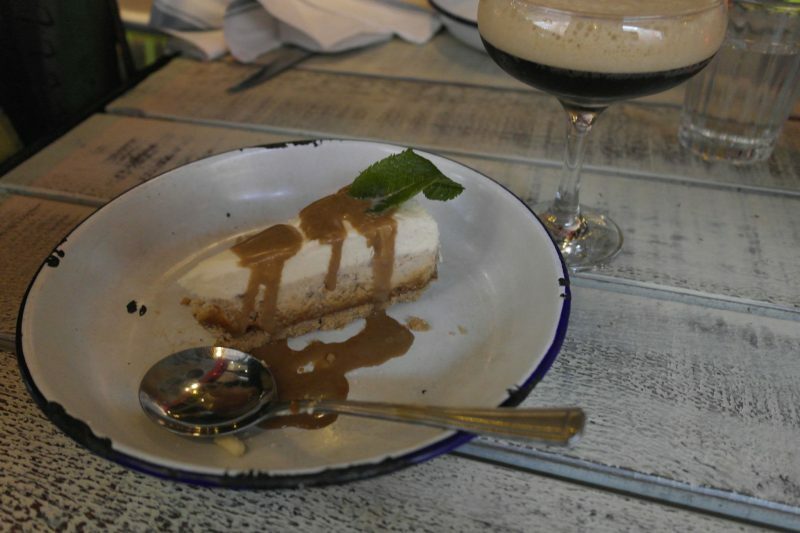 I couldn’t resist trying an esspresso martini to go with my cheescake, a first for me! 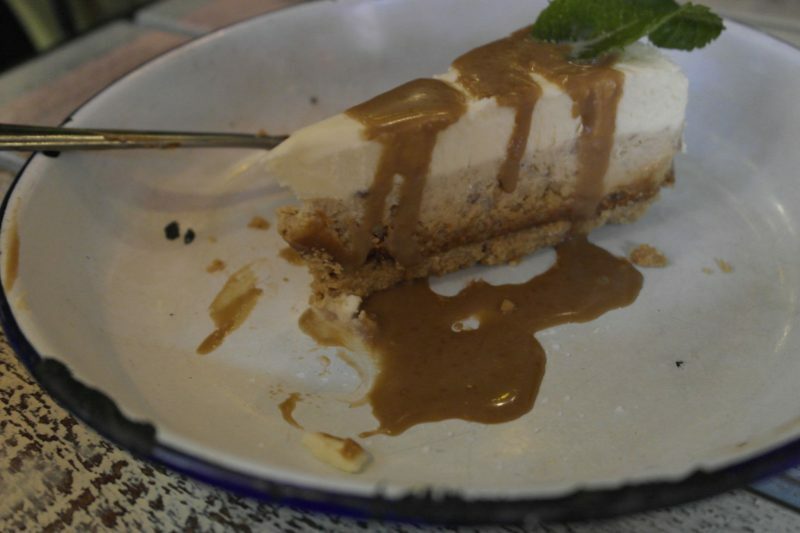 If you read my last review, I described it as possibly one of the best cheesecakes I’ve had! Second time around, it just didn’t seem quite as good for some reason! I’m not saying its a bad cheese cake, just not quite as good as I remember it being first time around. I’ve already got my eye on the rum and raisin bread pudding next time! 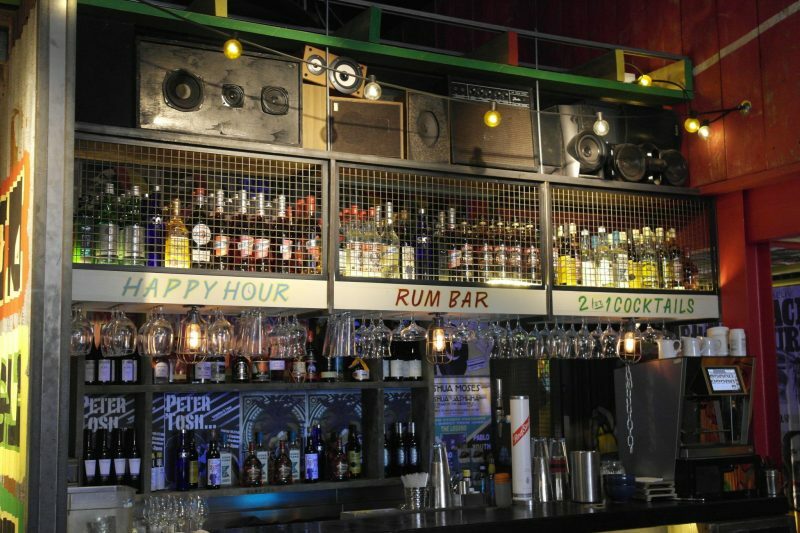 If you’ve not been to Turtle Bay yet but you enjoy Caribbean style food you really need to pay them a visit. I’m sure you wouldn’t be disappointed. 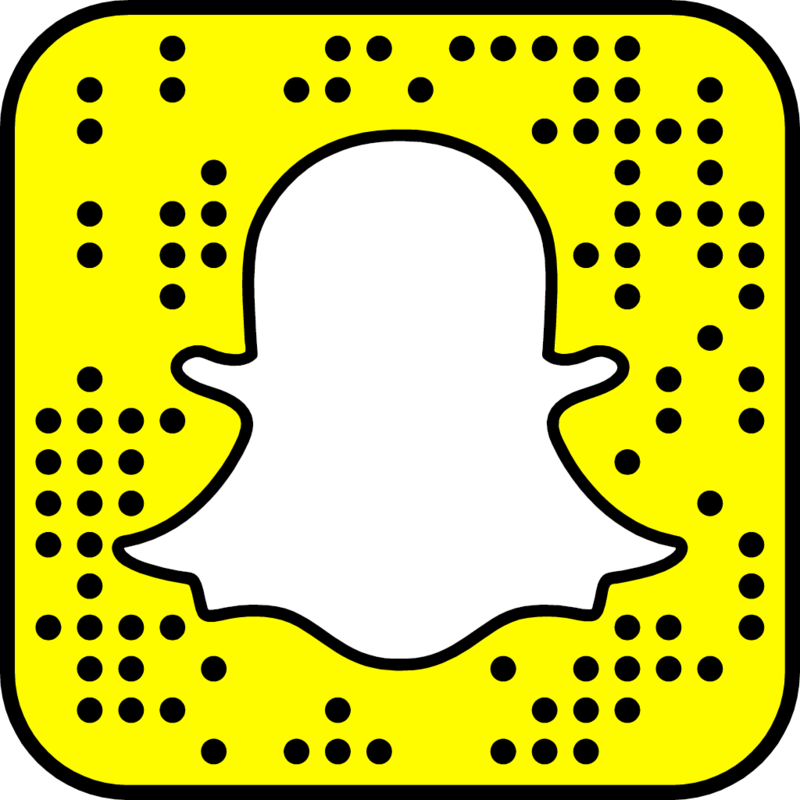 They’ve got a good selection of dishes including vegetarian options to cater for most tastes and they’re very reasonably priced as well! 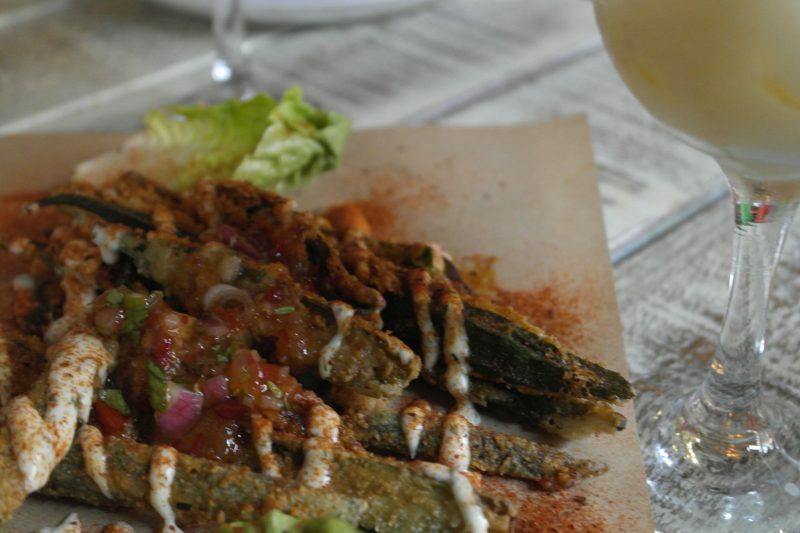 Have you tried the Turtle Bay summer menu? What was your favourite dish? *Meal was complimentary for review purposes. All views and opinions are my own. 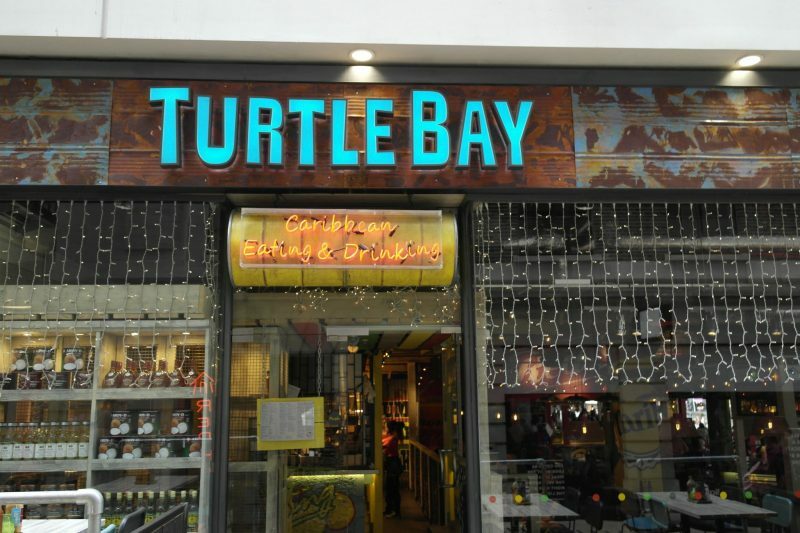 I’ve not tried Turtle Bay at all! Went past one the other day and was really impressed with their choice on the menu, different, varied and made my mouth water even though I had just eaten. 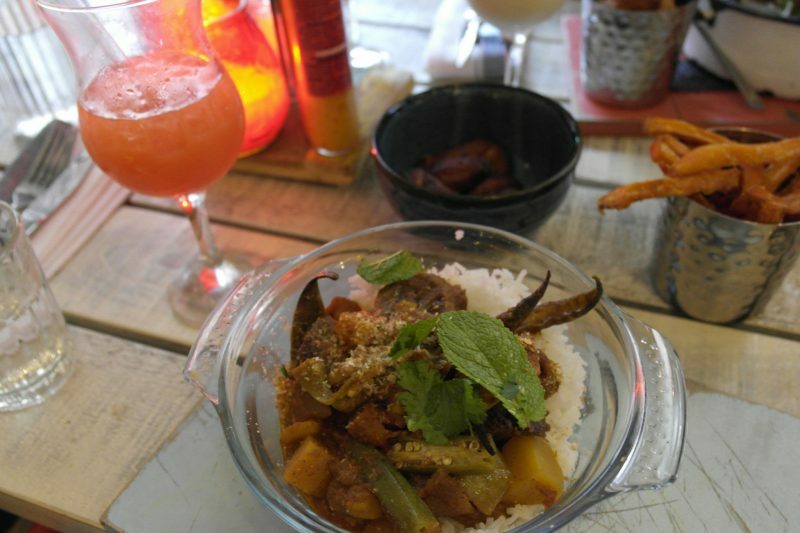 I love the sound of the curried goat and the just jerk platter – and the espresso martini! The first time I went, it actually surprised me a bit how good it was! 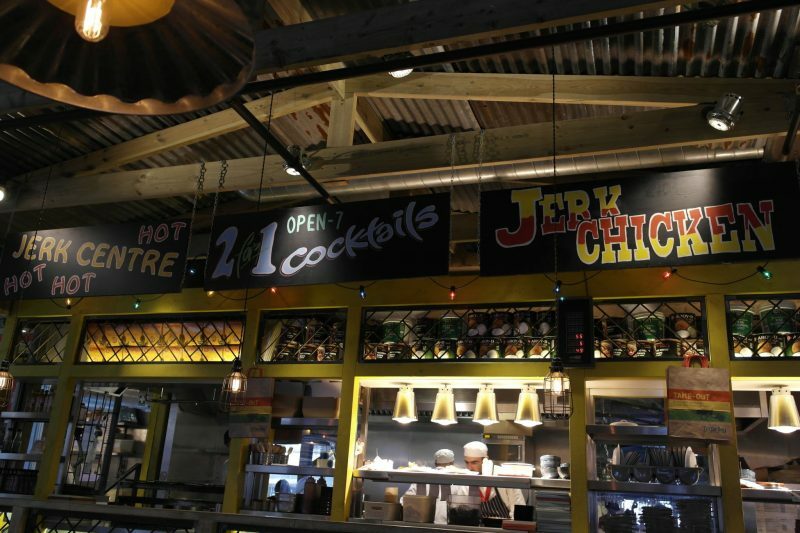 They’ve got something for most tastes, the jerk jerk chicken is just amazing though!